I for a very long time had a page on my site, Somervell County Salon (salon.glenrose.net) listing various open records documents that I had requested over time. At the time I pretty much stopped going to government meetings and recording them regularly (2010-2011), I had regularly campaigned on this site for government entities to put up their documents, including check registers, minutes, audio, and related documents so that all could more easily see what is going on at the local level. At the point that I stopped talking about this, most of the entities put their info online while a couple still didn't. Notably the two that were behind were the City of Glen Rose and the Somervell County Hospital Authority/District. Now, mind you, THAT WAS FOUR YEARS AGO. All copies of agreements, including management agreements between Glen Rose Healthcare Inc (the 501a) and Somervell County Hospital Authority/Somervell County Hospital District dba Glen Rose Medical Center from October 2009 to this date, to include any new management agreements made after the District was finalized. All copies of any reports in which money is shown to have been approved, from January 2013 to current date (August 8 2013) for the 501a (Glen Rose Healthcare Inc) above what the management agreement specifies; ie, shortfall type money. All copies of any reports in which money is shown to have been approved, from January 2013 to current date (August 8 2013) to be spent at Pecan Family Medical Center in Hood County, including payments to doctors, equipment purchases or rental, lease payments or anything else financial. If the lease for Pecan Family Medical Center has changed in any way from the previous lease since the Somervell County Hospital District has been finalized, I would like a copy of the new lease. If the cost of this is above $25, please let me know first. If you would, please let me know that you received this email. 1. There are no written agreements, including management agreements, between Glen Rose Healthcare, Inc. and Somervell County Hospital Authority, Somervell County Hospital District, and/or Glen Rose Medical Center. As such, there are no documents responsive to this request. 2. Attached are reports showing funds which have been transferred by Glen Rose Medical Center to Glen Rose Healthcare, Inc. from January 2013 to August 8 2013. 3. Pursuant to TEX. GOV’T CODE § 552.222(b), please clarify Request No. 3. Are you requesting documentation of any and payments made by Glen Rose Medical Center related to Pecan Family Medical Center from January 2013 to August 8 2013? If so, it will take some time to locate and pull all of the documentation. 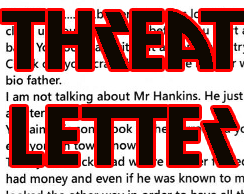 If we do not receive clarification from you by the 61st day after your receipt of this letter, Request No. 3 will be considered to have been withdrawn by you. 4. 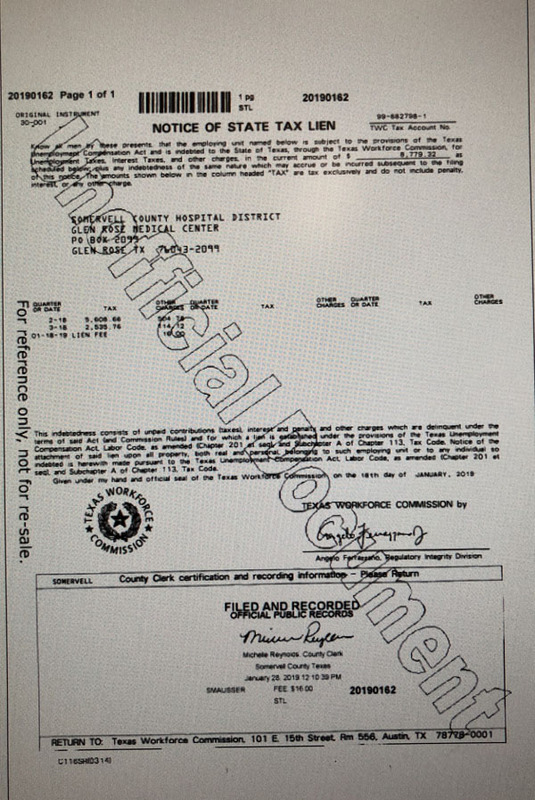 The lease at Pecan Family Medical Center has not changed since the creation of Somervell County Hospital District. "On January 1, 2010, Glen Rose Healthcare Inc (the "501a") entered into a management agreement with the Authority to provide for certain management services in exchange for a service fee. " You say below that there are no written agreements and no management agreement. Is then, the auditor's report wrong? Of course there IS a management agreement; I had actually forgotten that I had already gotten it in 2010. As I was thinking about it further, I decided to do a different public information request asking for the purpose of the monetary transfers based on what Sharla had just sent me. Per you request, all transfers were for financial/operational support. I wasn't asking for what they were, I am asking for copies of the written requests that were made by the 501a asking for the amounts shown below. There are no written requests or other written documentation from Glen Rose Healthcare, Inc. to Somervell County Hospital Authority which detail the purpose of the monetary transfers you specifically listed in your open records request. Just curious. How then, does GRMC know what amount of money to transfer to their account. If there are no written agreements about this money, as per the last request, and then, no specific written requests for the items below, is this all done verbally, ie, the doctors ask for money with no written requisition? Since there is not any written contract or agreement with the 501a (Glen Rose Healthcare Inc) nor any written requests from them for the amounts shown below, how exactly does the 501a notify GRMC about amounts they wish to have and what the amounts represent? At that point, I prepared a complaint about both spending tax money in Pecan Family Medical Center and the 501a slush fund. I called up Greg Doyle to ask how to do this, and he said to send the complaint to Darrell McCravy. At the time, Darrell was apparenty interviewing to be Johnson County's staff. I asked Greg Doyle about this in email. I had sent this to Darrell Mccravy on August 31, 2013. He wrote me back that he had not had a chance to look at it yet but would call me back after he reviewed it. I saw the other day that he is no longer working for the Somervell Sheriff’s Department, but has taken a good opportunity in the DA’s office. My question to you is, who is the person who has taken over looking at this complaint? I appreciate your letting me know you received this email, even if you don’t have an immediate answer. I met with Andy Lucas yesterday. He is said that he will review all the material and get back with me. I will let you know when he gets back with me. On November 16, 2013, because I had gotten NO response from this complaint, I sent an email to Greg Doyle and cc'd Andy Lucas, since that was who Greg said he was going to meet with 3 weeks before. The reference to attorneys refers to some documentation re: Pecan Plantation. I have not yet received any type of reply regarding the original complaint I filed at the end of August, 2013. In the meantime, I, through an open records request, found that the attorneys for the Somervell County Hospital District had written back 2 months ago to Andy Lucas. Attached see my response to that letter, which also includes some additional references. This is a supplemental document to be read in conjunction with the original complaint. I believe that some actions need to be taken. I await your reply. I spoke to Andy Lucas today and He indicated that he will not prosecute this case. Any further question should be directed to Mr. Lucas. I would like to hear your reasons for, at the least ,not getting an Attorney General opinion regarding this. If there was anything in Chapter 286 which prevented the district from doing so, I would take a look at it. If a citizen seeks injunctive relief from the district court, the judge can make the determination. You are saying that, for the first issue, which deals with Somervell County spending taxpayer money into Hood County’s hospital district, you believe that the remedy is for a citizen to file a civil lawsuit. Yes? Second, and I have not seen this specifically addressed, you are choosing not to investigate the issue of taxpayer money going into the 501a account without written accountability to show how taxpayer money is being spent. Yes? Yes, the remedy lies in district court in a civil action. 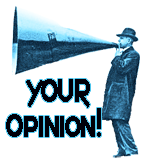 On the second issue, my office does not investigate complaints. That is not our function. Andy has answered the first part of my complaint, but the second has not been addressed. That is where Glen Rose Medical Center is putting money into a 501a account but not requiring, as the management agreement between the 501a and GRMC stipulates and as the audit references, written documents showing how the money is being spent. I originally requested that this be investigated by your office or, if you do not have resources, by the Texas Rangers. I haven’t had any specific answer to that part of the complaint. Have re-asked Greg Doyle as this was the second part of my original complaint which has not yet been addressed. Did NOT hear from Greg Doyle. I called him on the phone in December around the holidays and he said he'd been too busy with other things to follow up (I think there had been a really bad traffic accident at that time, so I was sympathetic to his needing to take more time. On 2/9/2014, I sent him an email again. Greg Doyle never replied to this. I have still not received a reply regarding the second part of this complaint. Would appreciate a written reply. I kind of gave up at this point. It seemed to me that even the sheriff didn't give a hoot about whether taxpayer money was being accounted for, nor did Andy Lucas. I like to think they didn't blow me off because I'm female. Plus, I decided that I'd wait to see who got elected in the Somervell County Hospital District election. There were some people, including my husband, who ran on the platform of being fiscally accountable and I decided I, as a citizen, could certainly make my views known to ALL of them and perhaps they could get something done. Imagine my complete shock when one of the people I voted for, Chip Harrison, decided to vote AGAINST GRMC following that 501a contract. Hub told me about this AFTER the meeting that night and, while he was getting a snack or something, I got on MY computer and posted an irate message about it. I still feel the same way. To add to this, here are all the items I have personally written about the shortfall. Dec 14 2009- Video I recorded with MY camera at the Somervell County Comissioners Court. Includes auditor talking about how taxpayers may need to,optionally, subsidize doctors via the 501a contract. Dec 23 2009- Who's in charge of open records requests? August 13, 2010-How much money has the 501a requested? Aug 19, 2014-Is the Slush Fund Going to be Addressed? Aug 21 2014- Shame on You Chip Harrison! Sep 24, 2014- WHY does Glen Rose Healthcare Inc need shortfall money? Updated: One more. My hub was temporarily removed from the board while he turned in a form to TMHP. The form was turned in on Oct 24th, 2014, and, even though Ray Reynolds knew by November 4th, 2014 that TMHP had it and had no problem with anything in it, he did not publicly let anyone know, until he was specifically asked status by the board president on Nov 17th. Even then, the letter, which was at that points in the hands of Andy Lucas, was not released even until Monday or Tuesday. Why the delay? In my opinion, here's one reason why that might be. Ray Reynolds knew as of Nov 4th that there was no reason not to have Harper back on the board, including in plenty of time to be part of those who voted one way or the other on the 501a contract. It was to his ADVANTAGE to not let anyone know, including the board president, until after the vote. In fact, a special meeting was called and posted on November 6th, and held on the 11th. I personally feel that this is not being an honest broker. And, again, to emphasize the point, *I*, salon, got this information FROM the board president and one of the active members (meaning that it was NOT my husband, who specifically and repeatedly did NOT engage or discuss or even LISTEN TO MY OPINION about hospital business). 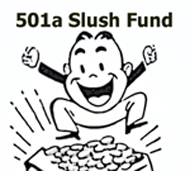 Nov 6, 2014 - Attempt by Ray Reynolds to change the terms of the slush fund. Nov 11, 2014- Vote to approve 501a contract that has had accountability gutted from it. The second main event that caught my attention was SR2O. A friend and I were talking and she asked me if I knew anything about it. I didn't, and actually, at first blush, didn't have much interest in it. All I knew is that some tire related company wanted to come to Somervell County and put up a plant.After looking into it, I discovered that Darrell Best and Larry Smith, as part of a private Somervell County Economic Board (NOT PUBLIC) had apparently gone to hire a guy from Arlington who would then bring business to us. The problem was that the company Jurey brought wanted something for nothing. A number of citizens made an outcry about this and SR20 went back to their first love, Alvarado. 3/13/2014-Why did Somervell County vote to make themselves a board? 3/21/2014- Was SR20 playing Somervell County? 3/25/2014- SR20 folded their tents and walked away, and Mike Ford WHINED about it. 3/25/2014- What WAS the SR2O proposal? 3/27/2014-Shadow Govt-Should there be an expectation that private money runs a town? 3/27/2014-What about the PFC board the Somervell County Commissioners voted to create? IS IT GONE????? 3/28/2014-Mike Ford Whined at the Commissioners Because They Didn't Vote His Way. 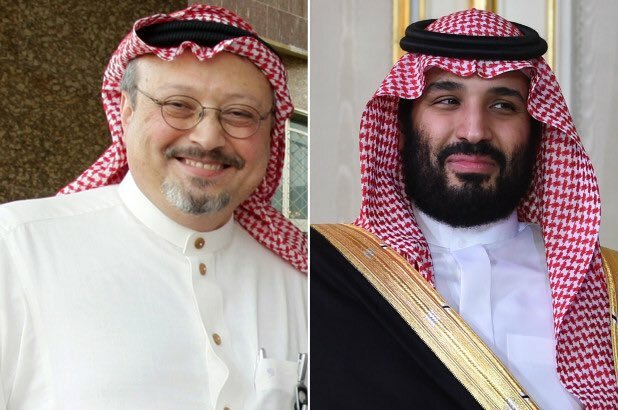 Salon--excellent job of capturing and reveling everything. Truth exposes a lot! Shows which elected officials are doing their job---also revels those that aren't. We really need to elect those that really take care of business and get rid of those only drawing a paycheck! I'm a strong proponent for following the law. All individuals holding office took an oath--I guess they (the ones exposed) did NOT take it very seriously !!!! Thanks cc -with you. I know that other potential crime must seem far more interesting than investigating whether tax money is being accounted for but in my book it's just as important.